Everyone has a story to tell. Jazz bassist Dave Baron lets his instrument do the talking. He has demonstrated his skills supporting such jazz luminaries as Eric Reed, Lew Tabackin, Mary Stallings, Peter Bernstein, Walt Weiskopf, Joe Lovano, Jimmy Greene, Joe Magnarelli, Wycliffe Gordon, Bruce Barth, and Bill Evans (saxophonist), among others. Dave has collaborated with other artists in countries such as Australia, Russia, Korea, Grand Cayman, and Romania. Dave moved to New York City in 2010 to attend the Juilliard School for his master’s degree. Under the tutelage of the legendary bassist Ron Carter, Baron performed with Herbie Hancock at Alice Tully Hall at Lincoln Center as part of a concert held for the 75th birthday celebration of Ron Carter. Previous to attending Juilliard, Dave Baron received his Bachelor’s Degree from the Eastman School of Music. Dave was selected as one of fifteen semi-finalists from around the world for the Thelonious Monk International Jazz Bass Competition. As part of the competition, he performed with pianist Geoff Keezer and drummer Carl Allen at the Smithsonian Museum of Natural History. 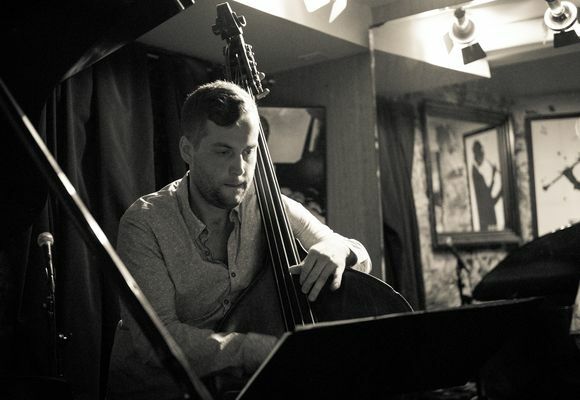 Soon after, he was awarded second place at the International Society of Bassists’ Scott LaFaro Jazz Competition. Baron participated in a professional development workshop with pianist Brad Mehldau, presented by the Weill Institute at Carnegie Hall. He also participated in workshops at the Banff Centre in Alberta, Canada where he worked with artists such as Dave Douglas, Scott Colley, and the ICP Orchestra. Originally from Simsbury, CT, Dave grew up playing the cello in local youth orchestras where he gained an appreciation for classical music. Despite Baron’s love for classical music through the years, his true calling was jazz. Dave was first exposed to jazz at the age of 12 while he was a paperboy for the Hartford Courant. On rainy days, his father would drive him around the neighborhood along his paper route, playing the radio where he heard such artists as Duke Ellington and Louis Armstrong. He began pursuing jazz seriously when he was accepted to the Greater Hartford Academy of the Arts during his junior year of high school, where he became a protégé of saxophonist Jimmy Greene. Greene introduced Dave to bassist Reuben Rogers. On weekends, Dave would travel into New York City to take lessons with him. It was during this crucial time in his life that he decided to pursue creating music with a purpose. Dave Baron is not only a performer in high demand, but is also a well-rounded educator. He currently is a faculty member of the New Jersey Performing Arts Center’s Jazz For Teens program where he teaches jazz ensembles, theory classes and bass students. Other teaching experiences include his time at Juilliard, when he was selected to join the Goldman Fellowship, working with students at Harlem School of the Arts. After graduation, Baron was hired by HSA as a faculty member. David has taught jazz workshops at The Trinity College in Melbourne, Australia, Snow College in Ephraim, Utah, and has presented master classes at numerous other institutions. He recently released his debut album entitled “Introducing Dave Baron” in the fall of 2015.